The compass biggest strength lies in its brand value which is the Jeep brand. The renowned American SUV maker is famed for its 4X4 vehicles, that enjoys a cult status across the globe. So, it is a matter of pride for the average Indian. Recently, FCA India launched a new variant of its renowned Jeep Compass SUV. The Jeep Compass Sport Plus 2019 price lies in the range of Rs. 15.99 Lakh to Rs. 21.67 lakh. But does the SUV justify its price? Let’s find out. 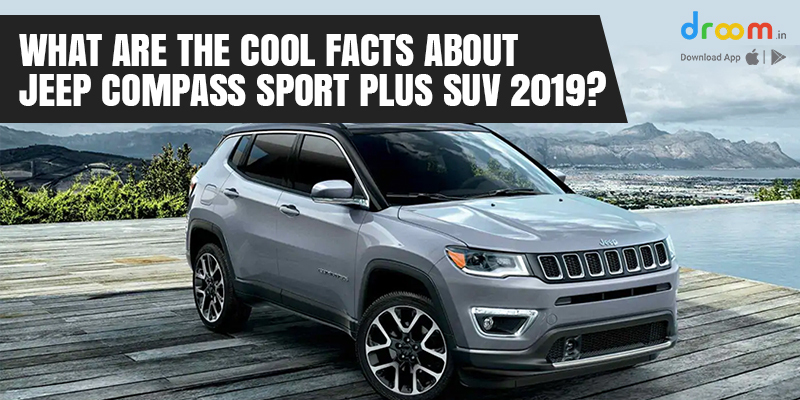 The Jeep Compass sports a premium and sophisticated look that is pretty evident if you look at the 2019 jeep compass sport plus images. The front view of the SUV features the same signature 7-slat Jeep grille that is common to all its jeep compass sport plus variants. The side profile looks are characterized by its massive 16-inch alloy wheels instead of 16-inch steel wheels, chrome strip across the body and shark fin design on the C pillar. The SUV features, projector headlamps with LED DRL and LED tail- lights with Sport Plus Badge at the rear and black roof rails which gives it a floating roof appearance. It is what’s is under the hood that matter the most. The petrol variant of the SUV is powered by 1.4 L Multiair engine that produces 161 bhp of power at 5500 RPM and an impressive torque of 250Nm in the RPM range of 2500Nm- 4000Nm. The diesel variant is powered by 2.0L Multijet II Turbo engine that produces 171bhp of power at 3750 RPM and an unbelievable torque of 350Nm which the secret for the relentless pull that SUV produces. The diesel engine of the SUV is one of its kind as the motor creates an unwavering pull up to the redlines after which the engine gets quite loud and coarse. The interiors of the SUV get the dual tone treatment which gives the interior decent looks. The 3-spoke steering wheel with audio controls and cruise control looks premium. The instrumentation cluster features a 7- inch U connect infotainment system with apple car play and android auto. Below the infotainment screen is the space for the gear lever, air conditioner, and the four-wheel drive controls. The addition of a dual-zone climate control system means that the driver and the rear passengers can set their preferred choice of temperature autonomously. The front seats have enough thigh and back support while the rear seat offers a good comfort due to an impressive head and leg room. The ingress and egress offer good comfort and does feel premium. The Jeep Compass is one of the few SUV’s that has passed the Global Crash Tests with high ratings which means the Jeep Compass is safe to drive as the materials used to build the SUV is of high quality and durable. The SUV features ABS( (Anti-lock Braking System) that prevents the tyres from locking up under emergency braking, thus preventing the skidding of the tyres. Apart from that, the Jeep Compass comes with loads of other safety features such as, 6 airbags, Electronic Roll Mitigation (ERM), electric handbrake, ESC (Electronic Stability Control), hill start assist, traction control, Brake Throttle Overdrive, keyless entry and go. The other safety feature includes an Electronic brake force distribution or EBD wherein the braking force on tyres can be controlled individually through the electronic system. Other safety features include standard EBD, PBA, HBFC and EBP, disc brakes on all four wheels, all aluminum front, and rear crumple zone, windshield glass with anti-fog coating and cornering fog lamps among several others. In all, there are over 50 safety features present in the SUV which makes it one of the safest SUV to drive. Although a compact SUV does not have the cargo and towing power of a full sized SUV, still the Jeep Compass Sport Plus does bring some serious power and torque in the compact SUV category. However, the Compass does stand out from the crowd in terms of its off-roading capability. The compact SUV comes equipped with multiple four-wheel drive modes for different terrains. The trims equipped with all-wheel drive have traction settings for terrain like mud, snow, sand, in addition to the automatic traction control. The presence of different drive modes makes the SUV a, trusted buddy for the off-road adventures. The Jeep Compass is one of the first manufacturers to introduce the Frequency Selective Damping (FSD) suspension in its segment. The FSD ensures that the rough road patches do not spoil the ride quality and provides you with the tough as nail suspension that makes a bumpy ride to a smooth one. The Mercedes-style Frequency Selective Damping is certainly built to conquer every bad road condition and makes the shock absorber go supple. The jeep compass sports on road price in Delhi is Rs. 20,21,335 which is a value for money given the presence of the latest features in the car.